This is one of the newest services to the market. This is not a game changer but has a few bright spots. This service would be best for families or people that want several different concurrent streams at one time. The price is on the higher end of the scale relative to other streaming services. The DVR service is a plus for those who like to record a lot. 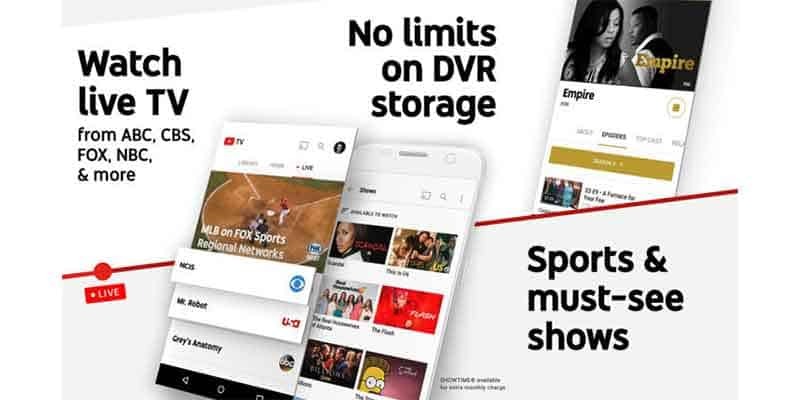 YouTube TV is a no-contract live TV streaming service that delivers live television through your internet connection to devices such as computers, tablets, smartphones, or streaming devices. It requires no installation, there are no extra fees, and you can cancel anytime. This service is separate from the normal YouTube that you probably know. 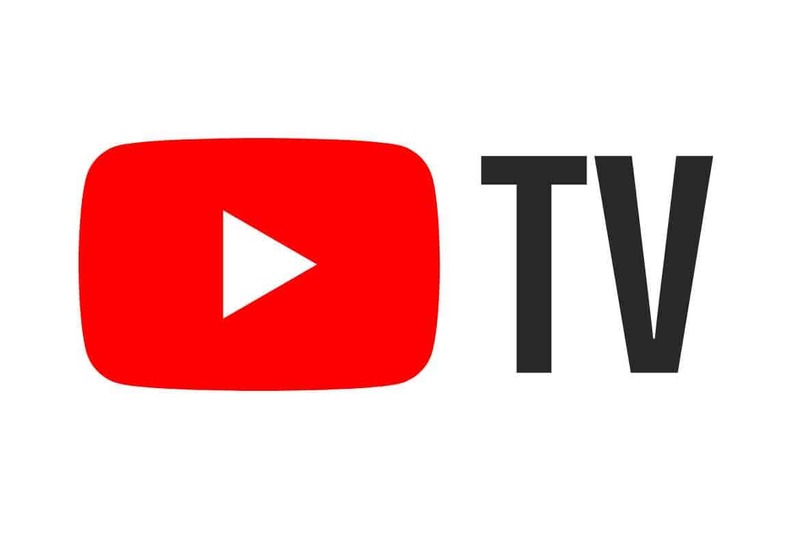 YouTube TV is one of the newest services having launched in February 2017. The streaming service offers more than 50 different television networks and programming from major broadcast networks such as ABC, CBS, The CW, FOX, and NBC. The initial launch of this service was limited to a handful of major markets but now is available in roughly 100 cities. YouTube TV has a fairly disappointing amount of options: one. The plan is priced at $40.00/month and can be canceled anytime with no contract or fees. The price increased in 2018 from $35/month to $40/month back on March 14, 2018 when the service picked up Turner Networks. There are also a few add-ons available but even this is a limited selection compared to other popular streaming services. This streaming service offers four-channel add-ons. Most other services offer HBO, Cinemax, EPIX, or some type of Spanish language add-on so this is a pretty disappointing selection for many cord cutters. *Subject to change. Confirm with YouTube TV. 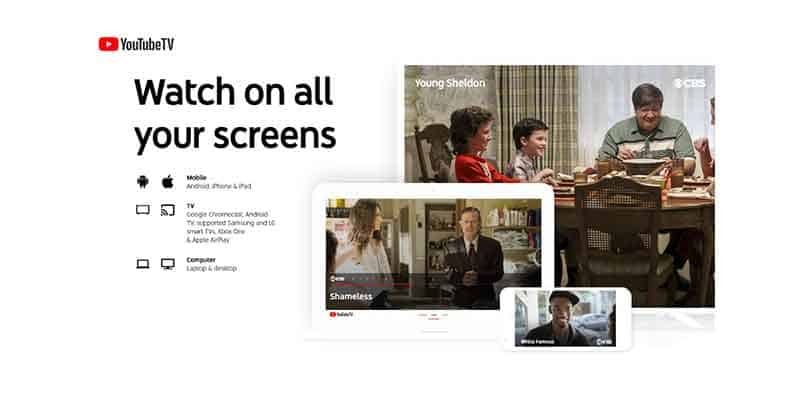 YouTube TV is supported by a wide array of devices leaving subscribers with many options. Users have the flexibility to watch their favorite shows and movies in a variety of different ways such as at home on your television or on your phone while you’re on the go. Here is a list of compatible devices. Compatible Browsers: Available on all browsers. Subscribers of this live TV service can watch on up to 3 devices at the same time. The cloud DVR offered to users is probably the one shining bright spot on an otherwise lackluster service. Subscribers get unlimited DVR service for free. You are allowed to keep recordings for up to 9 months which is much longer than most other services. You cannot record individuals episodes of shows however, you can only record entire series, sports teams, or major events. There are two unique features. The first is the family sharing feature which allows you to create up to 6 different user profiles that can be linked to Google accounts. The other is that users get access to original content from YouTube Red such as Buddy System, The Lazer Team, and Mind Field. Subscribers will gain access to roughly 23 different “TV Anywhere” channel apps such as ABC, Disney, and ESPN. There are no parental controls. Like many other services, there are limitations and restrictions depending on where you live. There are six local channels that are available in most markets: ABC, CBS, The CW, Fox, NBC, and Telemundo. This calculator is designed to demonstrate what your typical cost savings would be if you canceled your cable subscription and signed up for one of YouTube’s streaming plans. First, enter the cost of your current plan and then choose which plan you would like. Click here to see our 2018 Cord Cutting Calculator that includes all services.